ink and ashes: on netflix: dimension-hopping with "parallels"
on netflix: dimension-hopping with "parallels"
I came out of watching Parallels feeling the rush that comes with being exposed to high-concept science-fiction. A mysterious building that serves as a focal point for travelling between parallel universes? Yes, please! Years after Sliders went off the air – and failed to catch on with me given storytelling marred by behind-the-scenes production shenanigans, character switch-ups, and a series cliffhanger – now seems like a ripe time to revisit the concept with a grittier, hard-science approach. There was every reason to be optimistic, as the show is the creation of Christopher Leone and Laura Harkcom, the pair who delivered the underrated but fiendishly clever miniseries The Lost Room. Having already demonstrated a thrilling flair for handling space/time anomalies with a sci-fi perspective, I was curious to see how they would freshen up a familiar concept. 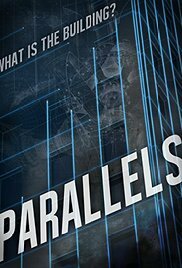 The good news is that Parallels is, overall, rather gripping. Unfortunately, it suffers from its ambiguous status as a movie slash series pilot slash digital product. With too many ideas crammed into 83 minutes, it doesn’t offer enough of a self-contained narrative arc for it to stand reasonably on its own, even as it sets pieces on the chessboard for the long game. Its last 10 minutes alone raises more questions and introduces more plot points than a cliffhanger, however intriguing and appetite-whetting, should be asked to handle without being frustrating and anti-climatic. Disappointing to various degrees are the characters, which consist of a taciturn brawler, a dork, a blank, and a streetwise traveler who tutors the other three on the finer points of universe-hopping. Of the four, only Mark Hapka’s Ronan, a troubled lad who left his family out of guilt to get himself beaten up in underground fighting contests, can be measured out in more than two dimensions. The savvy traveler, named Polly, stands out for her portrayal by the film’s strongest cast member, Constance Wu: pay attention to her as the gang travels from one Earth to another. As for the remaining members of the Scooby gang: the dork, played by Eric Jungmann, is a public defender named Harold who is positioned as a geek with occasional insight but is really there to shriek, panic, and irritate. The blank is Ronan’s sister Beatrix, an unremarkable character supposedly smart enough to be admitted to Princeton but who displays a shocking lack of thought or curiosity…but shrieks and panics almost as well as Harold. Thankfully, Jessica Rothe is less irritating than Jungmann. And what can I say about the decision, yet again, to feature yet more white protagonists (all but one)? To the film’s producers: I sigh and shake my head in your general direction. You would think that, in an age of comic books and sci-fi blockbusters galore, characters confronted with the weird would do more than stand around screaming about what happened. But no: the characters, except for Ronan, indulge a meltdown. And the lack of method and consideration? Sure, the characters will speculate and ask some of the obvious questions. Beyond that, however, they act like the protagonists of a horror movie: rushing into things without much forethought. Granted, they aren’t trained scientists…but shouldn’t they at least be somewhat intelligent and methodical in their approach to the unknown? Shouldn’t we expect more from a lawyer and a Princeton candidate? The weak characterization is a letdown given how Leone and Harkcom have shown themselves capable of delivering believably clever characters in unusual situations, such as Peter Krause’s cop protagonist in The Lost Room. Still, in that rush to the end, the needs of the plot outweigh the integrity of the characters. There’s the inexplicable ability for a stowaway named Tinker to hook up a device to controls the Building…about which he knew nothing about until the Scooby gang stumbled into his world. Also: a surprising familial development should cause the characters to raise a serious existential question, but is simply cast aside in favour of getting to the next parallel earth. The good news is that none of these shortcomings are insurmountable if Parallels does, indeed, become a bonafide series as its creators hope. Characters can be refined and deepened – their initial ineptitude waved off as shock and inexperience – while big, and not so big, questions can be allowed to breathe with the more relaxed pace of a series. In the proverbial big picture, none of the pilot’s limitations derail the effort to present a rich, intriguing, and intelligent variation on the many-worlds story. Although I’m wary when Leone states that the story that could be completed in 5 seasons, in part because of past history: The Lost Room, though self-contained insofar as its protagonist is concerned, didn’t come close to resolving its narrative and, years later, shows no sign of resuscitation – I do hope is given a chance. My optimism may be cautious, but optimism it is given the really fascinating premise and compelling world-building.